Veteran pilot loses simulated dogfight to ALPHA artificial intelligence. 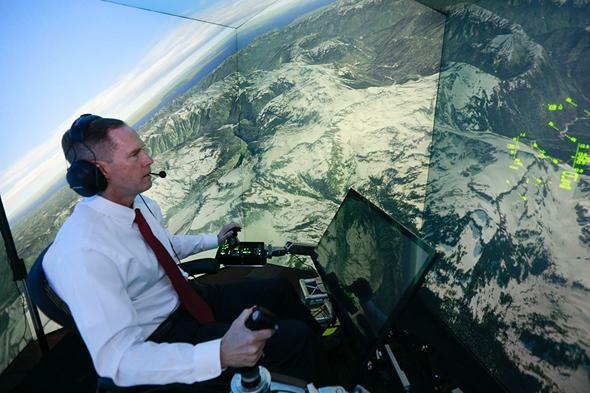 Retired United States Air Force Colonel Gene Lee in simulated flight combat against an artificial intelligence program. We’ve all heard that researchers are currently working to refine self-driving cars and other autonomous vehicles. The revolution is coming. It turns out, though, that they’re also setting their sights on using artificial intelligence to navigate situations you may not have expected—like aerial combat in fighter jets. Fighter pilots undergo extensive specialized training to be able to outwit opponents in battle, and that professional experience seems like it would be hard, even impossible, to replicate. But a new artificial intelligence system, ALPHA, has been besting expert pilots in combat simulations, even when the A.I. is given a handicap. ALPHA was developed by aerospace engineer Nick Ernest, a recent doctoral graduate of University of Cincinnati whose company Psibernetix works with the Air Force Research Laboratory. ALPHA has been victorious in numerous simulated battles against top fighter pilots, including a series in October against retired United States Air Force Colonel Gene Lee. It seemed to be aware of my intentions and reacting instantly to my changes in flight and my missile deployment. It knew how to defeat the shot I was taking. It moved instantly between defensive and offensive actions as needed. … Sure, you might have gotten shot down once in a while by an AI program when you, as a pilot, were trying something new, but, until now, an AI opponent simply could not keep up with anything like the real pressure and pace of combat-like scenarios. ALPHA’s prowess is impressive, but equally amazing is the tiny computer that runs it. For such a complicated set of decision-making algorithms, ALPHA requires very little processing power, running on a $35 Raspberry Pi minicomputer. ALPHA uses what are called “fuzzy logic algorithms” to form a “Genetic Fuzzy Tree” system that breaks big problems down into smaller chunks so the system can evaluate which variables are relevant to a particular decision and which of those are most important. This allows the system to work more efficiently and rapidly. ALPHA still flys in a simulated world, but as technology continues to evolve behind combat drones and autonomous vehicles it seems more and more likely that it will converge in something like the real-world version of ALPHA. It’s a powerful technology, but it makes you wonder whether we as humans really want to be getting “better” at war. Hopefully these advances will mean fewer human casualties.